In the last edition, we discussed the effect that horizontal visible iris diameter (HVID) has on the sagittal height of the cornea. Since most “off the rack” soft contact lenses are available with only one diameter and either one or two base curves, we wanted to share with you the effect this has on our day-to-day contact lens patients. Several years ago we did a retrospective study that demonstrated the effect that corneal diameter played on the final soft contact lens that we dispensed. We reviewed the charts of 64 patients who were successfully wearing the Preference Toric soft contact lens. We chose this lens design for the study because the higher modulus of the lens material required a more precise lens fit for optimal success. The Preference Toric soft contact lens is supplied with a single diameter, therefore the only way to adjust the sagittal height of the lens is by base curve selection. The fitting guide recommends choosing the 8.4 mm base curve for corneas that are 45.00 diopters (7.50 mm) or steeper and the 8.7 mm base curve for corneas that are flatter than 45.00 diopters. We discovered that 26 of the 64 patients (40 %) were wearing a base curve outside of the fitting guide recommendations. Forty-five of the patients had K readings flatter than 45.00 diopters, but 20 (44%) of them required the steeper (8.4 mm) base curve. Nineteen of the 20 had an HVID of 12.0 mm or larger. We had a similar finding with the 19 patients who had K readings steeper than 45.00 diopters. Seven of 19 (37%) were successfully wearing the flatter (8.7 mm) base curve. All seven of them had HVID measurements of 11.5 mm or smaller. In another study we carefully measured the HVID of 200 consecutive patients who entered our clinic. We found them to have a normal bell-shaped distribution that occurs in most population studies. 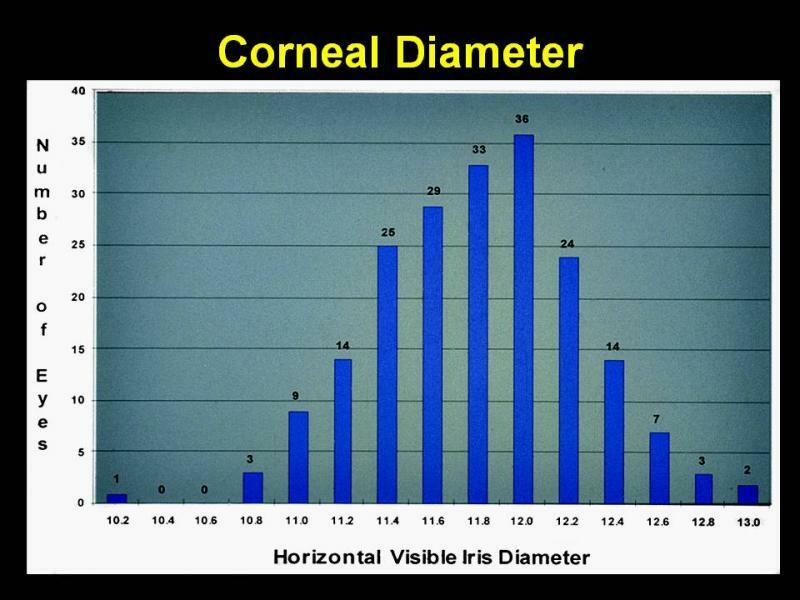 The graph shows that most of the patients are clustered around 11.8mm; only those at the ends of the curve have particularly large or small corneas. The parameters of most contemporary soft contact lens designs are limited to one base curve and one diameter. We’ve observed that in our clinical practice the primary reason for custom design of soft contact lenses is to accommodate patients who have larger than average corneal diameters. Through this clinical experience, we have heightened our soft lens prescribing success by paying careful attention to each patient’s overall corneal diameter and utilizing this as the basis for designing our custom soft contact lenses. Matthew received his Doctor of Optometry degree from Pacific University College of Optometry in Forest Grove, OR, where following graduation he also completed a residency in Cornea and Contact Lenses. He is currently an assistant professor at Pacific University College of Optometry where he is involved with specialty contact lens fitting, contact lens instruction of optometry students, and clinical research. He is also an associate in a private practice in Oregon and a consultant to SpecialEyes. Mark is an associate professor of Optometry at Pacific University College of Optometry in Forest Grove, Oregon. He is also a consultant to CooperVision and a specialty contact lenses and instructing both Ophthalmology and Optometry Residents since 1979. He lectures primarily on the subject of contact lens design on this subject since 1979. Mark is a Fellow member of the Cornea and Contact Lens Section of the American Academy of Optometry. He is also a Fellow member of the Contact Lens Society of America and a past board member of the society. In the past, he served as chairman of the board for the National Contact Lens Examiners.